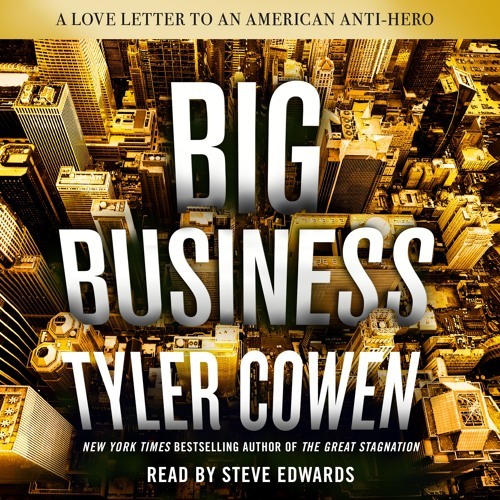 Listen to an excerpt of Tyler Cowen's BIG BUSINESS, read by Steve Edwards. An against-the-grain polemic on American capitalism from New York Times bestselling author Tyler Cowen. We love to hate the 800-pound gorilla. Walmart and Amazon destroy communities and small businesses. Facebook turns us into addicts while putting our personal data at risk. From skeptical politicians like Bernie Sanders who, at a 2016 presidential campaign rally said, “If a bank is too big to fail, it is too big to exist,” to millennials, only 42 percent of whom support capitalism, belief in big business is at an all-time low. But are big companies inherently evil? If business is so bad, why does it remain so integral to the basic functioning of America? Economist and bestselling author Tyler Cowen says our biggest problem is that we don’t love business enough. In Big Business, Cowen puts forth an impassioned defense of corporations and their essential role in a balanced, productive, and progressive society. He dismantles common misconceptions and untangles conflicting intuitions. According to a 2016 Gallup survey, only 12 percent of Americans trust big business “quite a lot,” and only 6 percent trust it “a great deal.” Yet Americans as a group are remarkably willing to trust businesses, whether in the form of buying a new phone on the day of its release or simply showing up to work in the expectation they will be paid. Cowen illuminates the crucial role businesses play in spurring innovation, rewarding talent and hard work, and creating the bounty on which we’ve all come to depend.